Carol Hutt was born on March 21, 1931 to Flora Ernst Stewart and Robert Allen Stewart in Tecumseh, Nebraska. 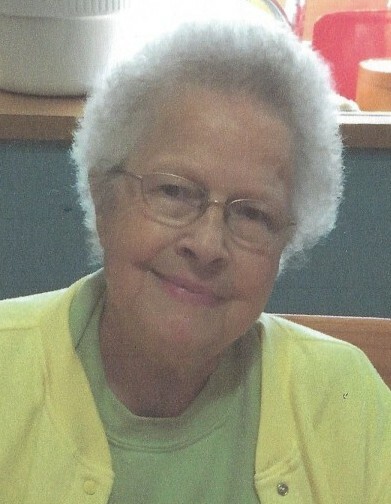 Carol passed away on July 30, 2018. Carol attended country school District 23 from 1st to 3rd grade. She began 4th grade at Tecumseh Public and her class size went from 3 to 40, which was thrilling and stimulating to her. 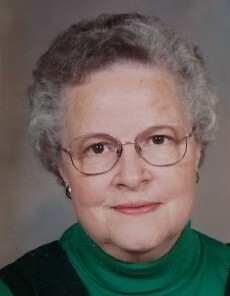 She loved school and graduated from Tecumseh High School in 1948. Her favorite area of study was literature and composition. Carol often displayed her reading and writing talents when delivering programs for church groups and clubs. She was a published writer and poet. Her greatest love was reading. Carol enjoyed baking and preparing meals for her family and friends. Following graduation, Carol moved to Lincoln, NE and worked for Bankers Life Insurance Co. Carol moved back to Tecumseh and on August 28, 1949 married Orville Hutt. They were both very proud to raise 5 children; Jim, Tom, Ginny, Chris and Dan. Carol liked being a mother and felt very fortunate to stay at home and raise her kids. Later in life, Carol worked for Tecumseh Public School as a cook. She cooked the main course at the school for 16 years. She always mentioned that she had excellent co-workers and they all took pride in their work. She also enjoyed seeing family members at school as students or teachers. Carol took time off to care for both Tom and Orville. Tom passed away at age 33 on Jan. 12, 1988. Orville passed away at age 63 on Nov. 15, 1991. Carol moved from her home of 30 years and then enjoyed watching Ginny and Bob raise their children in the family home. Carol was always an active member of the United Methodist Church, holding many church offices, participating in women’s group and choir. She enjoyed organizing the annual Christmas Bazaar. On May 20, 2018, Carol was honored for 75 years of faithful service to the United Methodist Church. Carol proudly followed her children and grandchildren’s activities. One of her greatest joys was following Tecumseh and Johnson County Central basketball, while watching from her designated seat placed for her by Coach Hutt. Carol’s sisters, Norma, Marge and Marilyn were her best friends. Their reunions each summer were looked forward to and treasured. Carol is survived by her daughter Ginny Beadell and husband Bob of Tecumseh, son Chris Hutt and wife Gail of Tecumseh, son Dan Hutt of Lincoln, daughter-in-law Sally Hutt of Tecumseh, grandchildren Bob Hutt and wife Michelle of Lincoln, Alexandra Goering and husband Blake of Auburn, Gabrielle Anderson and husband Eric of St. Paul, MN and Madeline Beadell and fiancé Brennan Frierson of Lincoln, step-grandchildren Abby McLennan and husband Brian of Draper, UT, Jesse Hippen and wife Misuzu of Tecumseh, Amanda Lysaught and husband David of Denver, step-great grandchildren Connor Haufle, Allie McLennan, Lucy Hippen and Winnie Lysaught, sisters Norma Wicks of Albuquerque, NM, Marge Stitt and husband Jerry of Lincoln, Marilyn Nobbman and friend Duane Johns of Syracuse, brother-in-law and sisters-in-law Keith and Lila Hutt of Tecumseh and Millie Hutt of Omaha, cousin Helen Allen and husband Mel of Ralston, NE, nieces, nephews, cousins and friends. Carol was preceded in death by her parents, Bob and Flo Stewart, husband Orville, sons Tom and Jim Hutt, granddaughter Ann Hutt, grandson Dr. Noah Beadell, brothers-in-law Jack Wicks, Laverne Hutt and Kenneth Hutt and sister-in-law Shirley Hutt, nieces Susan Hutt and Susan Nobbman and nephew Steve Hutt. Carol donated her body to the Nebraska Anatomical Board to further the education of medical students. A Celebration of Life Service will be held at 10:30 a.m. Saturday, August 4, 2018 at the United Methodist Church in Tecumseh, Nebraska with Pastor Rob Clark officiating. Register book signing will be 9:00 a.m. to 5:00 p.m. Friday, August 3, 2018 at the Wherry Mortuary in Tecumseh, Nebraska. Memorials in lieu of flowers may go to the family’s choice.